joanna's mother knew she wanted to incorporate her daughter's colors of blue and turquoise into the bridal luncheon she was hosting. i didn't want to make it completely match her wedding suite, but i did want to compliment it, so i designed the invitation with a kraft paper background and a simple, but whimsical white border to serve as the key design element, and combined it with a traditional typeface and a fancy script to highlight the bride's name. the luncheon is taking place in newport, rhode island, so i wanted to keep the invitation + menu very traditional with a touch of whimsy. 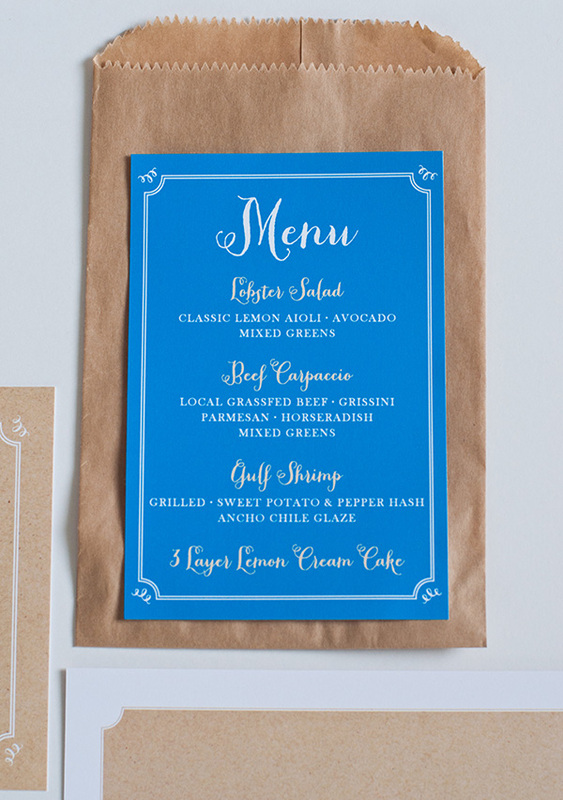 placed in a kraft paper bag, the menu compliments the invitation, but is printed on turquoise paper and kraft and white serve as the colors for the type.